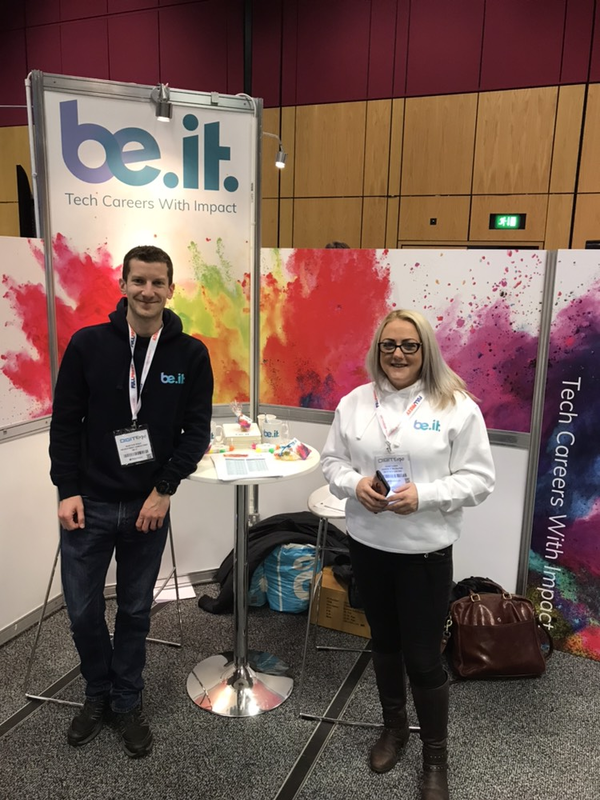 Yesterday, we all got dolled up in our lovely new Be-IT hoodies (modelled here by me and my colleague, Alastair Philp) and headed for the Edinburgh Exhibition and Conference Centre for the first ever Digit Expo event. Along with colleagues from our Glasgow office, we manned the stand for what turned out to be a tremendously successful inaugural event. From our perspective, as exhibitors, the main hall was well organised, with plenty of room for people to walk around the dozens of stands, plus a central (essential) coffee and sandwich emporium and lots of desks and chairs around the periphery for those who needed to fire up their laptops and do some work. More to the point, there was a constant flow of people around the exhibition area, at all times of the day and not just at the usual coffee and lunch breaks. From our point of view, that was a definite plus and we had a lot of good conversations with people who either need to recruit or are looking for a career change. As regards the conference proper, our marketing team took in several of the sessions, and reported back that they were uniformly good, with a special mention for Ian Thornton Trump, Head of Cyber Security at AMTrust International, whose presentation on GDPR was excellent. All in all, a good day, and congratulations to the team at Digit for organising it. I'm sure they had a sleepless night beforehand, but, for us and, I'm sure, for the vast majority of attendees, it was very worthwhile.